Girl : Are we both girlfriend and boyfriend. Boy: Because girlfriends are too demanding, " I want this, I want﻿ that", doesn't suit well. Check out this October 2014 BBC news article about how McDonalds has "conquered" India. 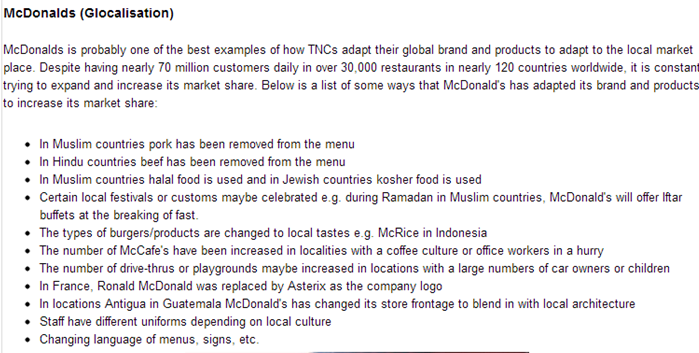 How did McDonalds glocalize their product to fit the Indian food market? 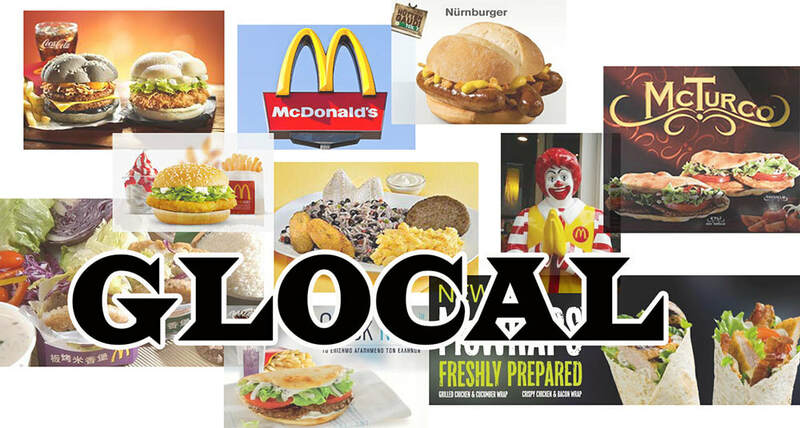 ﻿Mc - Glocalization ﻿ - "think Globally and Act Locally"
Objective: To be able to distinguish between the terms globalization and glocalization and to examine the extent to which commercial activities at a local scale have become globalized. Glocalization: The adaptation of a global product for a local market place. The word comes from an amalgamation of the words globalisation and localisation. Globalization: The spread of economic, cultural and social ideas across the world. Localization: The act of operating locally in terms of employees, product, supply of raw materials, etc. Click here to be taken to the McDonalds world website. Here you can visit the regional sites of McDonalds around the world and watch their current publicity videos etc. Click on your home country and see if you can find any evidence of the product being glocalized to meet local tastes. Click on the website link for India and start exploring the menu options. Bear in mind that the majority of Indian's do not eat beef products. Click here to find out why. i. Comment on the types of food available and the level to which they have been glocalized. ii. Comment on children promotions and their socio cultural impacts on the target audience. A summary of glocalization can be found here linked to McDonalds. Commerical activities at a local scale have also become globalized. This means that the old method of 'one advert to suit everyone' is long gone. When is the last time that you saw a badly dubbed shampoo advert on the television? Copy down the percentage approvals for each country set out and then describe how the marketing of both Colgate toothpaste and Nike are adapted at a local scale to fit in with the local cultural values. Objective: To be able to discuss civil society responses to globalization; the adoption, adaptation (glocalization) or rejection of globalized goods, services and cultural traits. What is a civil society? Any organization or movement that works in the area between the household, the private sector and the state to negotiate matters of public concern. Civil societies include non-governmental organizations (NGOs), community groups, trade unions, academic institutions and faith-based organizations. Task - We will be using the work on GATW to complete this unit. Click here to be taken directly to the page. Watch the three videos to the right hand side to familiarise yourself with these organisations. 1. To use the Slow Food Movement to evaluate the relative costs and benefits of local commercial production to the producer, the consumer and the local economy, compared with the costs and benefits of globalised production. 2. To use Survival International to describe the role of civil society in raising awareness of local and global environmental, social and cultural issues. 3. To use Traidcraft to examine the role of civil society in supporting local economic activity and strengthening local cultural values. The Amish normally pray in families and not churches. Congregation are based on location. Each congregation normally has about 25 families. Prayer meetings are held in different houses on a rotating basis. Members are normally baptised between the ages of 16-25 and are encouraged to marry within the Amish community. 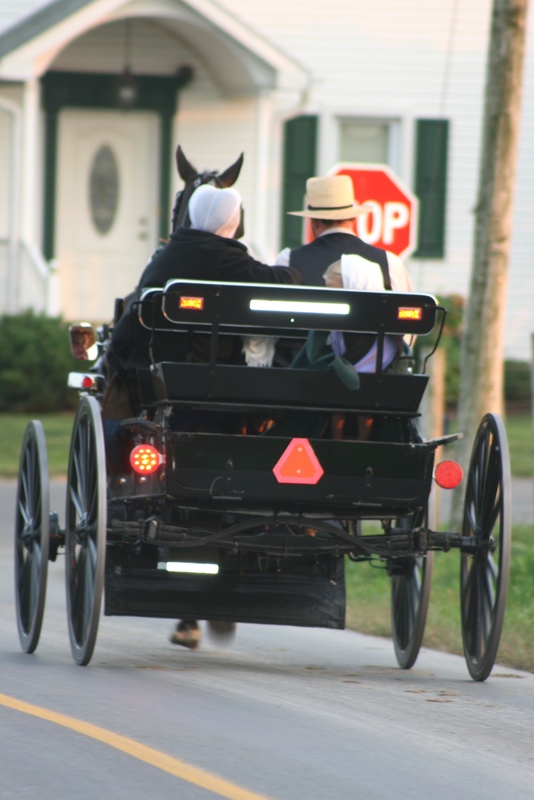 Family groups are very common within the Amish community. Elderly members are cared for within the family and also corporal punishment is handed out within the family. Objective: To be able to evaluate the quality of life of a contemporary non-globalized society. Task 1 - Make a 5 point 'Need to Know' factfile on the Amish people and their approach to a non globalized lifestyle from the text above. Task 2 - Watch the first 20 minutes of any of the 4 serialised documentaries to the right. i. Make a list of the types of globalization that the Amish teenagers will be exposed to in the UK. ii. Make a list of the ways you can see that the Amish resist globalized society. TOK'ing Point - What are your thoughts on the title and approach that this programme takes? Are the extremes "too extreme" to make a fair comparison? Task 3 - Open the worksheet below and sort out the statements into order following the instructions carefully. Task 4 - Watch the fifth video down on ther right hand side. Outline how the six British teenagers from the UK will find life challenging in a contemporary non-globalized society. You may finish watching the series in your own time. The videos are available on YouTube. "The Amish, despite their resilience, will be unable to resist the spread of globalization". To what extent do you agree with this statement?